Critics faulted Franz Ferdinand’s last album, 2005’s You Could Have It So Much Better, for both sounding too much like their 2004 debut and not containing an ear worm like “Take Me Out.” Fans, then, should be pleased to learn that Tonight, the band’s electronics-heavy third record (out today), demonstrates a compelling evolution for the Glaswegians and also features “No You Girls” and “Lucid Dreams,” two of their best songs ever. 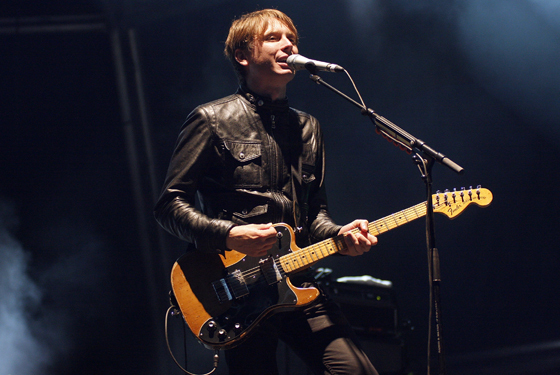 We spoke with front man Alex Kapranos on Franz’s new sound, the dangers of choreography, and how rumors get started. The difference between the production on this album and your two previous ones is pretty large. Were you trying to reinvent yourself here? When we started writing a year and a half ago, we really wanted to create a new sonic identity. The way we created our sonic identity before, it became ubiquitous. You heard it everywhere. So we wanted to evolve and use the bass guitar and other instruments a lot more, and slow the tempo down a bit, which makes it heavier but with more room to swing, as well. Last April you released an early recording of “Lucid Dreams,” which sounded a lot like the old Franz Ferdinand, with just guitars and drums. But the version on Tonight is totally different, with lots of keyboards and a five-minute synthesizer coda. Did all the new songs undergo such a dramatic evolution? A lot of the songs were changed for many different reasons, there was a lot of trial and error. You really only understand whether a song’s good or not when you properly play it out in public for the first time. It’s like if you get yourself a really great pair of red trousers, and you’re sitting at home looking at them like, “Ah, these are fantastic.” And then you go out and your friends don’t say anything to you about them, [and] you know that they were a bad mistake. I remember the first time we played “Take Me Out,” it sounded terrible. A while ago, Nick McCarthy gave an interview in which he claimed that this album was going to be African-influenced. And everyone on the internet got worried that you were going to make a record with just kalimbas and hand percussion or something. Then later, you claimed it was going to have “a streak of electronica,” and all the blogs freaked out again. Were you trying to scare people? No, it’s more just a case of Chinese whispers. Half of it was our decision not speak to the press while we were writing. But when we ended up accidentally giving an interview, we would say things and they’d get picked up and exaggerated. I think Nick talked to a journalist who said, “Do you like African music?” And, quite honestly, he said “Yeah, we do like African music.” And he asked “Is it an influence on your music?” And Nick said, “If we like it, there probably is an influence there, yeah.” But we’re four guys from Glasgow — we’re not going to make an African record. But if you mention that once in an interview, in the context of no other interviews, it carries whispers. Especially on the internet. The internet is like a gossipy girls’ locker room after school, isn’t it? The covers of your first two records shared similar aesthetics, but again, this one is quite different. What was the idea there? For our previous records, we took a lot from Russian Constructivism, and that geometric style really suited the sound, those sharp corners and edges. This time around that didn’t seem appropriate — the music didn’t sound like how that looked. We were looking for something new, and it’s a combination of two ideas: One is based loosely on the idea that Cindy Sherman had, the untitled film stills where she would pause for a photograph as if it were a still from an imaginary film; you would look at the photograph and, although the film didn’t exist, you would create the characters and the plot and the location in your imagination. And then there’s mid-century crime-scene photography, where everything is a moment frozen by a powerful flashbulb, everything’s a very brutal form of black and white. Are you choreographing any new dance moves for these songs? We never choreograph our dances! It’s spontaneous. God, if you try to choreograph that, you’ll break your legs. No, I don’t choreograph. I don’t have the memory capacity to learn choreography; we just do whatever we feel like doing on the night.